“Fieldwork isn’t glorious!” - that’s the first piece of advice that I received as an intern for the Savanna District - Upper Mississippi River, US Fish and Wildlife Service. 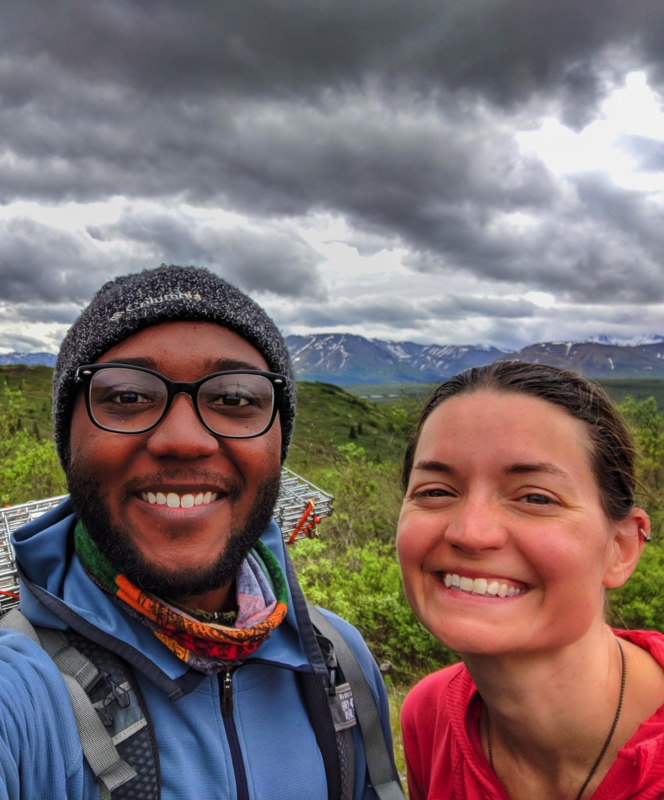 Those words are profound because they tap into our tendency as scientists and in pop culture to romanticize working in remote and often extreme natural settings. Challenges are framed as an interesting adventure and your success is often defined by how deep you delve into the work. At the time, those words wrung hollow - using conventional radio telemetry to find ornate box turtles (Terrapene ornata ornata) in the sand prairie habitat of Illinois felt quite glorious. It was hard work, but definitely much easier than what I had anticipated. Regardless of what I experienced during the day working, I had the comforts of sleeping in my own bed, visiting family during the weekend, and catching up on the TV show Parks and Recreation. It was a pretty tame experience - completely unlike my current experience as a PhD student conducting research in Denali National Park, AK. When people speak of needing to unplug from their daily lives and to go on adventures in wild spaces, Alaska could be what they have in mind. As the biggest US state, part of the Arctic and circumpolar north, Alaska is famous for its wilderness and wildlife. However, intense warming in the Arctic due to increased greenhouse gases, almost two times the rate of the global average, is poised to disrupt both Alaska’s wildlife and it’s wild spaces. The consequences are alarming, and clearly documented in places like Denali National Park and Preserve, AK. Glaciers are receding, shrubs are growing where they never were, and animals are increasing that historically were rarely seen. It is for this reason that I spend my summer backpacking in Denali National Park. 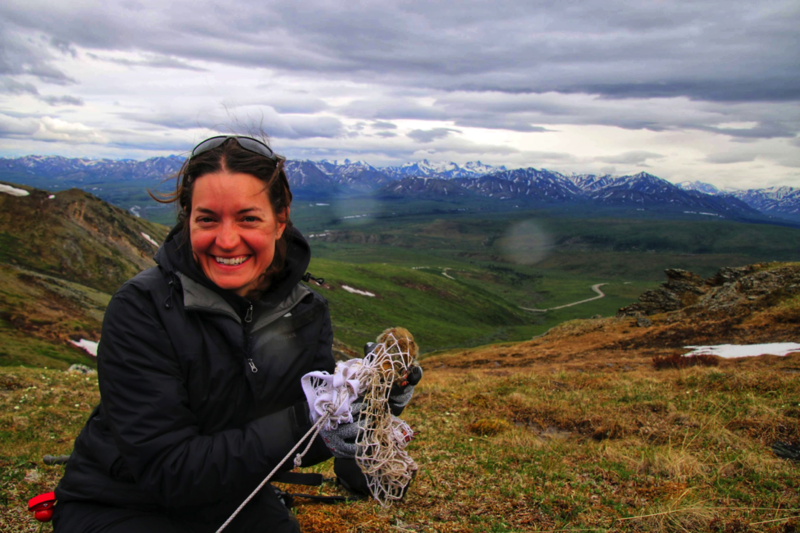 My research focuses on how environmental changes due to climate change will impact Arctic-adapted species like the arctic ground squirrel (Urocitellus parryii) and develop models that will predict shifts in their abundance and distribution. However, to make predictions for Denali, we need to know a lot more about them. This requires that we spend copious amounts of time in the field. Denali National Park and Preserve, which is larger than the state of New Hampshire, has almost no trails. Without the 92 mile road that bisects the park, gaining access to most of the park would be almost impossible. But there are other complications that make fieldwork in Denali unpredictable. For instance, my favorite unit in the park - Primrose Ridge, which is perhaps one of the best examples of alpine tundra and features many arctic ground squirrels - is pretty easy to access. However, finding water and a site to camp can be pretty difficult. In order to find a great camping spot, you need to hike to the top of the ridge, despite incredible views, this can put you in danger with the elements. A lightning storm and high winds in July 2017 had me performing mental gymnastics on whether it was safe enough for me to stay in my tent, or to run out in the rain, down the side of the brushy mountain obstructed by alder. My research advisor, Dr Toni Lyn Morelli, also visited Primrose Ridge with me in June 2018 during which we experienced on and off rain and strong winds daily for a week. “I feel so lucky to have been able to participate in fieldwork with Nigel in Denali NP. I’ve done research in the tallest mountains in the northeast, in the Sierra Nevada, and in the subtropics of Madagascar. I’ve lived in a tent for over a year, backpacked through remote backcountry for weeks on end, and conducted fieldwork in settings where we had to avoid black mambas, crocodiles, hippos, and hyenas. But fieldwork in Denali was tough." Suffice to say, conducting fieldwork here can be quite overwhelming and the best laid-out plans can unravel quite quickly. It takes an incredible amount of autonomy and independence to successfully see the completion of a project. When things don’t work out, the challenges can easily turn into self-blame and not be productive. The best way to deal with this is to keep in mind that that even in the most chaotic moments, if you expected for your plan to go awry, you can mentally prepare yourself to deal with it. Similar to mentally preparing yourself for unexpected moments, is to realize that you’re not the only field researcher to deal with these feelings. While not everyone will experience to the same extent the feelings of isolation, stress, and anxiety, there are many people who have and we should create more room in our universities, departments, and labs to have these discussions.